The Young lab combines nanofabrication and electronic measurement techniques in order to investigate the properties of electronic states in quantum materials. Currently, we are interested in the interplay between symmetry, topology, and correlations in low dimensional systems, both in equilibrium ground states and with strong electromagnetic drive. 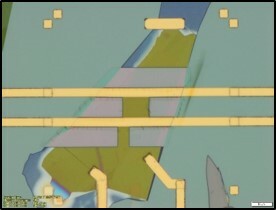 Our approach combines novel heterostructure fabrication techniques with cryogenic measurements designed to access the subtle electrical, magnetic, and thermal properties of these fragile electronic states. By combining two dimensional crystals into nanofabricated “van der Waals” heterostructures, we can engineer electronic structure along a variety of axes while simultaneously enabling measurements to probe their thermodynamic and transport properties. Outlines of several projects can be found below.